The MY2013 Ford Escape marks the third generation for Ford’s compact crossover. Although there was a refresh in 2008, it still looked very similar to the vehicle that debuted in 2001. Many of the Escape’s competitors, such as the Honda CR-V, Toyota RAV-4, and Hyundai Tucson, for example, have underwent more modern facelifts in the not-so-distant past, but the Escape had maintained its boxy SUV looks. That is, until now. For 2013, the Escape has been brought into the 21st century with a more modern, more rounded, and less truck-ish look. Also updated are its powerplants, which now feature two turbocharged engines in addition to a normally aspirated 2.5-liter four cylinder. Our test model, the mid-level Escape SE, featured the smaller of the two turbocharged mills; a 1.6-liter EcoBoost four cylinder making 178 horsepower and 173 ft. lbs. of torque. Just likes Escapes of yore, new versions are available with either front- or all-wheel-drive. Our tester was the FWD model. 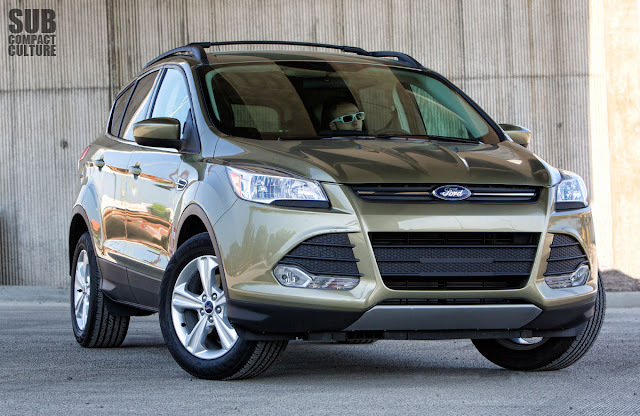 The Escape may warrant a “Most Improved” exterior for 2013. Gone is the square shape. In its place is a very attractive, swoopy crossover look. Its aggressive looking front fascia gives way to sculpted lines which leads to a much more exciting vehicle to look at compared to some of its crossover competitors. Our model came with the 17” alloy wheels. Larger and more attractive 18” and 19” wheels are also available. Regardless of wheel size, the Escape is one of the best looking compact CUVs out there, offering up a sporty modern look. 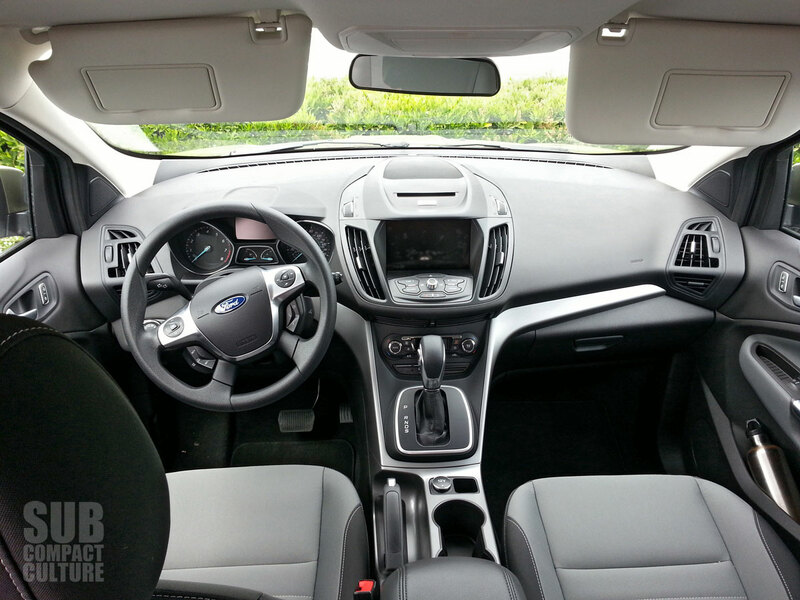 Inside, the Escape features an equally attractive interior. As with many of the new Ford’s these days, there are lots of swooping futuristic looking tidbits and a good amount of silver detailing. There were a few things that seemed a bit off, however. When the gear selector is in “park,” you can forget about accessing the climate control (the ’13 Ford Mustang GT is the same way). However, like the Mustang, you can access the climate control via the large LCD touchscreen monitor in the center stack, so there are actually two ways to heat things up or cool things down. It seems a bit redundant, but it does work; you just need to remember to use the LCD screen. We could also have used a few more cubbies to store things such as mobile phones, sunglass cases, and other smallish items. On a positive note, the instrumentation was excellent, offering analog gauges with a digital center readout for things like fuel information, odometer, navigation, radio preferences, and more. It’s a very good looking gauge stack, if I do say. Ford’s little EcoBoost engine has a lot of usable low-end power; enough to easily bark the front tires from a dead stop. Things seem to run out of steam in the upper ranges, but power is certainly adequate. Those looking for more power should opt for the powerful 2.0-liter EcoBoost that makes a very healthy 240 horsepower. 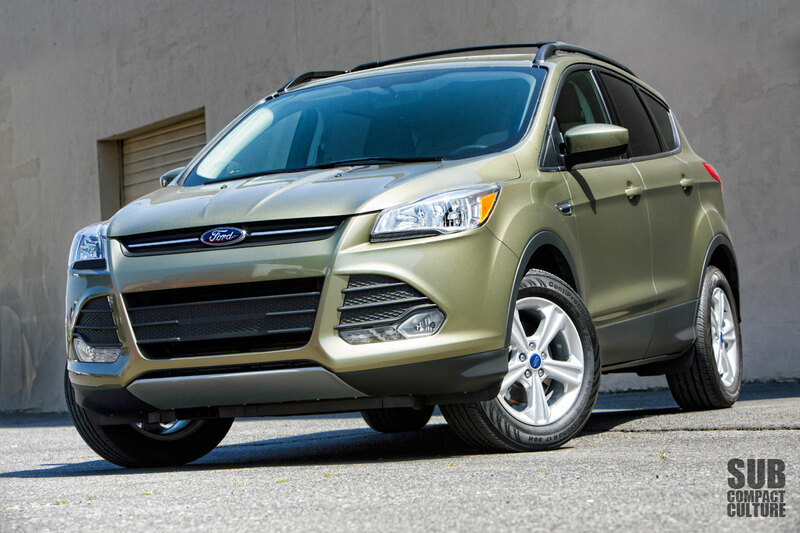 All Escape models come with Ford’s six-speed SelectShift transmission which can be shifted manually if desired. There’s also a sport mode if you’re so inclined. Once on the move, we were a surprised by the amount of squeaks and rattles the vehicle exuded; certainly more than we expected. Most of them came from the center stack near LCD monitor. These noises weren’t evident around town, where the vehicle felt poised and tight, but rather at highways speeds. Additionally, there was an above average amount of wind noise around the front windows. Fortunately, the CUV’s ride quality is very good, and freeway cruising is very comfortable. 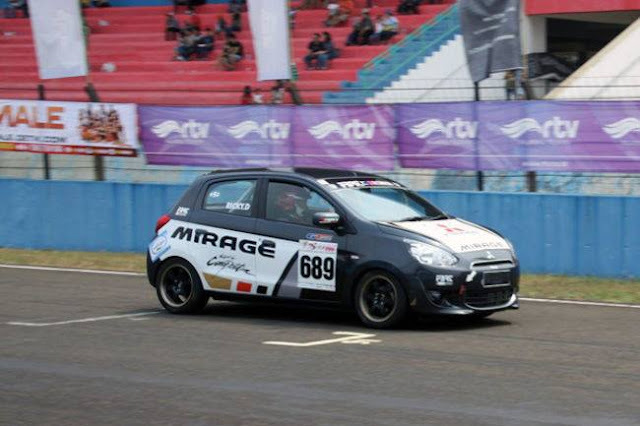 Cornering is confident, but the car can feel weighty at times. 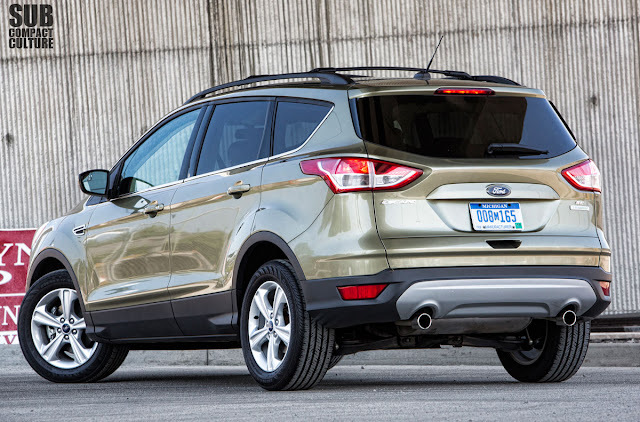 Around town, the Escape drives easily, although it does feel big for a compact crossover. Parallel parking it might be a challenge for those used to smaller cars, and our SE model didn’t come equipped with a back-up camera. We also figured a $28,860 Escape would’ve included things like one-touch-up windows (at least on the driver’s side) and heated seats, but it doesn’t. The seats, however, are very comfortable, and have a distinct bucket-style feel. The rear seating area is cavernous; there is a ton of room back there for even tall people. seats and the start of the cargo cover. Although you may not get the above-mentioned amenities for this price, you do get Ford’s excellent Sync system that allows you to do a multitude of functions via voice command. You also get a ton of space. The back seat is huge and very comfy. The cargo area is also very large, and the rear seats easily fold down to reveal a bunch of cargo carrying capability. There might be no Costco run too big for this crossover. Well, it easily handled my Costco run, anyway. 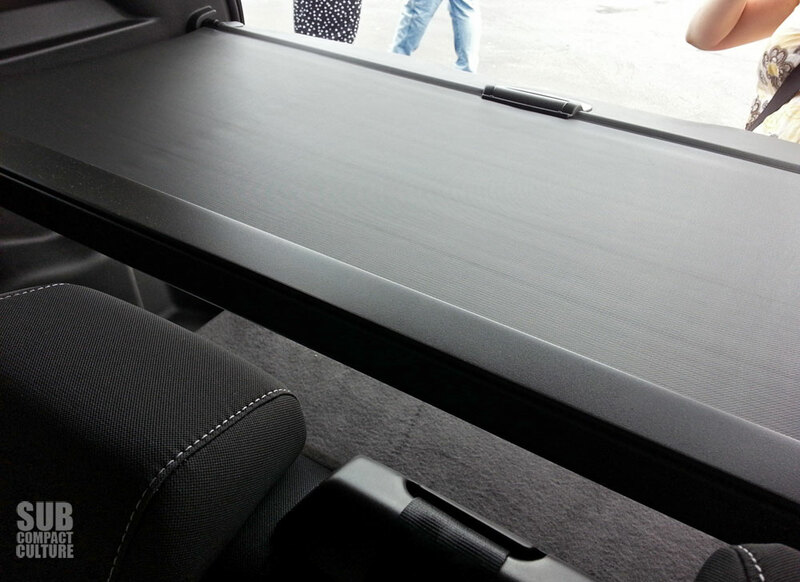 One gripe: There is a gap of a few inches between the rear seatbacks and the cargo caver. Might be a minor thing, but it could allow onlookers a peak at what’s underneath that cover. Rated at 23 city, 26 combined, and 33 highway, we got 23.1 MPG in mostly city driving situations; the car, despite having a turbocharged engine, does run on regular 87 octane fuel, too. While I really like the Escape’s looks, interior style, and user-friendly technology, at nearly $28,000, there are some amenities that should be included, such as the rear camera, auto-up windows, and heated seats. And unfortunately, there were those aforementioned squeaks and rattles. Plus, at $28K, you’ve still got the 1.6-liter engine, not the 2.0-liter powerplant. Step up to a FWD Escape SEL and you’ll get a few more features, but you can easily push past $30,000. The Titanium model, with all the options, will run you into the $30K range as well, but comes with everything including the 19” wheels, the power liftgate, 2.0-liter engine, and leather. The Escape was a bit of a mixed bag for me. Loved the looks, but not the rattles. Very nice looking interior, but it seems like it should have some more features. 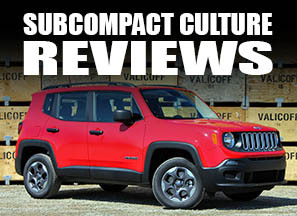 Overall, it’s a worthwhile competitor in the compact CUV market, but is on the spendy side. The vehicle is definitely one that should be shopped by those looking for a compact CUV, as it does have some good qualities. However, shoppers will have to decide whether or not it’s worth the price of admission.